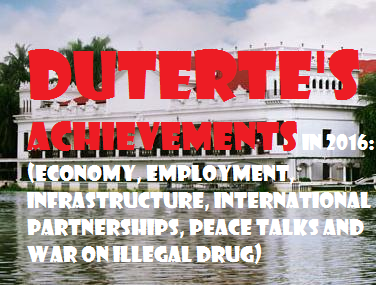 Home Agency Duterte Executive Government News President Palace identifies 6 point of view in Duterte’s Administration in first 6 months. Palace identifies 6 point of view in Duterte’s Administration in first 6 months. The Philippine is making progress in Duterte's Administration. Philippines with a 7 percent GDP in the first three quarters is one of the fastest growing economy in ASIA in 2016. The expected GDP in 2017 according to NEDA is between 6.5 and 7.5 percent. And when it comes to poverty, the full implementation of the Responsible Parenthood and Reproductive Health will be observed. There are also an approximately 41.7 million Filipinos employed, while unemployment rate also declined to a record low of 4.7 percent. To equip our students with competencies we need to strengthen academe, technical education institutions, and industries. New Nayong Pilipino and Entertainment City. Embarking on foreign trips to Southeast Asian countries, China, Japan, and Peru. Making progress for more partnerships with our neighboring countries in 2017 ASEAN Summit hosted by the Philippines.